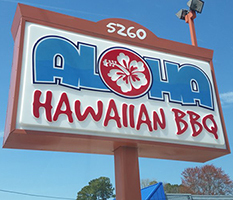 Hawaiian-style grilled meats & Asian eats, like sushi & noodles, in an island-themed setting. RESERVATIONSCall (757) 499-9699 to make a reservation. Our menuWHAT IS A PLATE LUNCH? 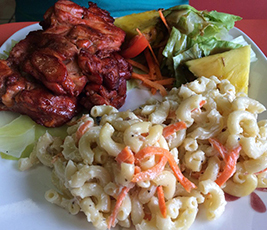 A plate lunch is a classic Hawaiian meal composed of entrées served with rice & macaroni salad on the side. 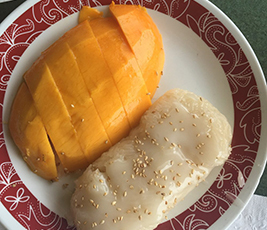 It's the meal of choice in Hawaii, and best characterizes the blend of cuisine and culture found on the Islands. 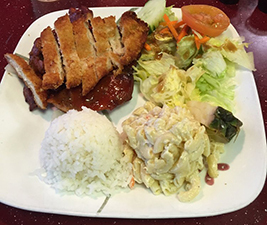 Incorporating Hawaiian, Chinese, Japanese, Korean & American cuisine, the plate lunch includes entrées such as Chicken Katsu, Kalbi Short Ribs, Mahi-Mahi, Kalua Pork, BBQ Chicken, Salads & Hamburgers. 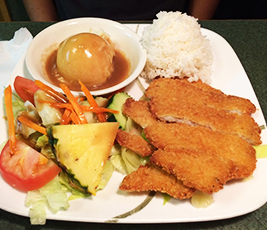 A combination of our favorite BBQ Chicken and Chicken Katsu. A delight for Chicken lovers. 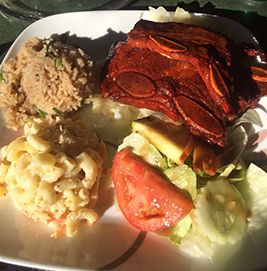 BBQ Chicken, BBQ Beef & Kalbi Ribs. 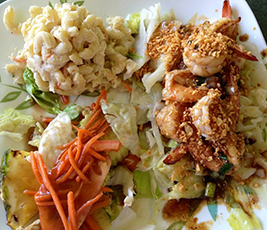 Savor our Crispy Shrimp along with our famous Hawaiian BBQ Chicken. For a great meal, combine our tender Mahi-Mahi and flavorful BBQ Chicken. 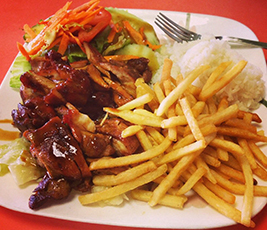 A combination of two of our most popular items: BBQ Chicken & BBQ Beef. 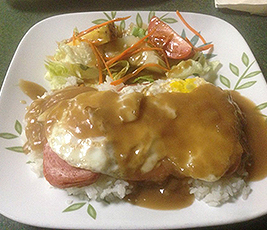 A true local dish - sliced Spam served with our house gravy and 2 eggs. Grilled boneless & skinless chicken marinated in Hawaiian BBQ sauce. Crispy breaded chicken fillets served with special Hawaiian sauce. Grilled boneless chicken served with our house teriyaki sauce. Marinated in Korean style BBQ sauce then grilled to perfection. Grilled slices of lean & tender beef, marinated in Hawaiian BBQ sauce. Juicy 8oz. hand made hamburger patty grilled to perfection and topped with cheese. One of our favorites - grilled tender pork chop, served with our special sauce. 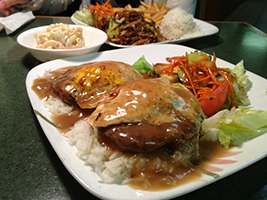 Hamburger patties served with gravy & topped with 2 eggs. Smoke-flavored, succulent shredded pork slowly roasted to a flavourful finish and mixed with cabbage. 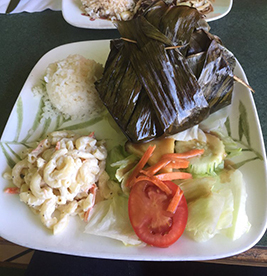 Hefty pork chuck wrapped with taro leaf, steamed to perfection, and served with rice or macaroni salad. 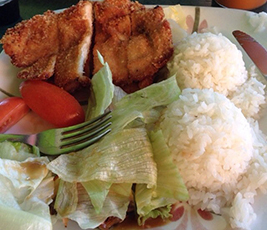 Hawaii' s favorite fish fillet marinated, lightly breaded, then tenderly cooked. Plentiful portion of deep-fried shrimp. 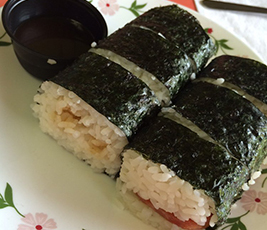 In Hawaii, we call it real "Ono" (delicious). Sautéed shrimp over vegetables, served with house garlic sauce. Alternate vegetables, onion, peppers and shrimp or beef on a stick. Masman curry mixed with potatoes, pineapple chunks, onions and topped w/ roasted peanuts. 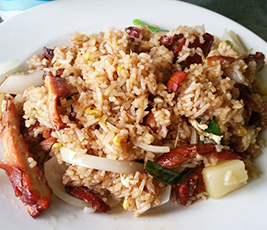 Jasmine rice stir-fried with choice of meat, onions, green onions, egg and pineapple. Masman curry mixed with potatoes, pineapple chunks, onions, slices of tofu and topped with roasted peanuts. 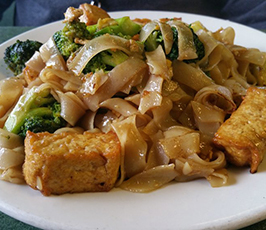 Slices of tofu stir-fried with rice noodles, ground peanuts, bean sprouts and green onions. Catering order may required one day advance notice. Delivery service available with $200 and up. 50% Deposit required for pick up order. Specially prepared noodle mixed with Aloha broth - available with grill spam or fried shrimp. Noodle soup with choice of chicken, beef or pork with bean sprout, green onion and cilantro. Steamed dried noodles with sliced & ground chicken, bean sprout, ground peanut, black soy sauce, lime juice, sugar, green onion and cilantro. Choice of chicken, beef or pork stir-fried with large noodles and topped with oyster sauce gravy. 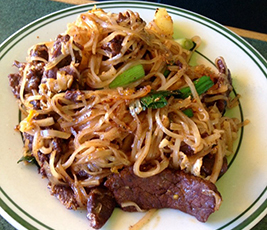 Choice of chicken, beef or pork stir-fried with rice noodles, egg and broccoli. Choice of chicken, beef or pork stir-fried with rice noodles, chili sauce, basil, tomato, broccoli, bell pepper & onions. Choice of chicken, beef, pork or shrimp stir-fried with sweet basil leaves, sliced onions, garlic, bell peppers and chili peppers. Choice of chicken, beef, pork or shrimp stir-fried with bell peppers, cucumbers, pineapple chunks, baby corn, onions & cooked in sweet & sour sauce. 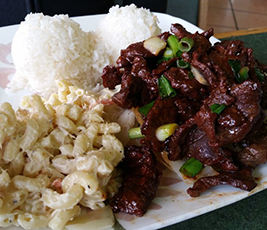 Choice of chicken, beef, pork or shrimp stir-fried with broccoli, garlic and our special sauce. 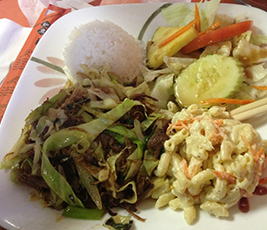 Choice of chicken, beef, pork or shrimp stir-fried with sliced bell peppers and onions. Choice of chicken, beef, pork or shrimp stir-fried in curry, Thai oyster sauce, sliced bamboo shoots and string beans. Choice of chicken, beef, pork or shrimp stir-fried with snow peas in Thai oyster sauce. Choice of chicken, beef, pork or shrimp stir-fried with sliced ginger, carrots and snow peas. (chicken, beef, pork or shrimp) Red curry sautéed with coconut milk, slices of bamboo shoot, bell peppers & sweet basil leaves. (chicken, beef, pork or shrimp) Panang curry sautéed with coconut milk, bell peppers & sweet basil leaves. (chicken, beef, pork or shrimp) Masman curry mixed with potatoes, pineapple chunks, onions & topped with roasted peanuts. (chicken, beef, pork or shrimp) Green curry sautéed with coconut milk, green peas, bell peppers and sweet basil leaves. Jasmine rice stir-fried with choice of meat (chicken, beef, pork or shrimp), onion slices, egg and chopped green onions. Fresh shrimp stir-fried with jasmine rice, onion slices, egg & chopped green onions. Chicken, fresh shrimp, beef & pork stir-fried with jasmine rice, onion slices, egg & chopped green onions. Fresh crab meat stir-fried with jasmine rice, onion slices, egg & chopped green onions.